“Rewards repay investments many times over for British firms in Japan”, was a key message from a major initiative to boost exports to 12 Asian markets, organised by the RBS Group and UK Trade & Investment (UKTI). “Doing Business in Asia: Meet the Experts”—a programme of practical events held in Bristol, Newcastle and Hinckley in late November—was presented by the Asia Task Force, which was set up by UKTI and RBS in 2004 to increase Britain’s trade with China, Hong Kong, India, Indonesia, Japan, Malaysia, the Philippines, Singapore, South Korea, Taiwan, Thailand and Vietnam. 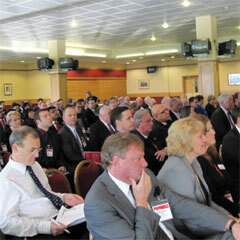 Between 80 and 130 delegates attended each event. Many delegates attended to raise their awareness and understanding of opportunities in Asia at on-the-ground political and business briefings given by UKTI directors and representatives of successful UK firms in Asia, such as Tim Harrap, export manager at Adams Foods Ltd., who has been responsible for exporting British cheeses such as Pilgrims Choice to Japan and launching Dorset Cereals here. The events are aimed at UK firms that have an interest in, or already have some experience of, Asian markets and want to expand. Experts also offered bespoke and practical advice on common legal issues, managing risk and cash flow, while delegates—including CEOs, directors, senior decision-makers and managers involved in business development or international sales and marketing—networked to develop vital industry contacts. At interactive market clinics that offered delegates specific information from experts who had flown in from each country, Sue Kinoshita, director of Trade and Investment at the British Embassy Tokyo, said: “Japan may have just lost to China its place as the second-largest market in the world, but its per capita GDP is still five times that of China, and more than 10 times that of India. “Success in the market demands a long-term perspective, a commitment to quality, after-sales care and a good deal of patience. But as many firms, including hundreds of small and medium-size enterprises, have discovered, the rewards in terms of partner and customer loyalty, benchmarking against the best, and a stable, reliable market structure repay the investment many times over”. In the south-west of England, where 4,480 businesses exported goods worth £37.4 million a day in the first half of 2010, about 120 delegates at the Marriot Royal Hotel in Bristol heard speakers such as Lord Powell, co-chair of the Asia Task Force and Stephen Pattison, head of international business development at Dyson, one of the UK’s best-known brands in Japan. Paul Marston, RBS managing director for the region, said: “The export market in the south-west has a huge and growing role to play in the region’s prosperity, and the importance of Asia in this will increase. We’re delighted to support the UKTI Asia Task Force and hope this event encourages more local businesses to make the most of growth opportunities in Asia”. In the north-east, where visible exports come to about £30.2 million a day, about 80 delegates went to the Newcastle Racecourse to hear Kevin Tokell, RBS international trade director for the region, say: “We provide expert advice and practical help in the form of trade finance, cash management services and extensive on-the-ground support in Asia to many businesses in the north-east, and the UK as a whole, that trade in the region”. A further 132 delegates at Barcelo Hinckley Island Hotel heard that East Midlands’ exports are worth about £38.9 million a day. Peter Hogarth, international trade director at UKTI East Midlands, said: “Asia represents a very exciting opportunity for businesses in the East Midlands, and we can provide them with a unique range of services to help them succeed there. Asia is enjoying strong economic growth and British business needs to ensure that it is capitalising on this as much as possible”. During 2010-11, the RBS Group and UKTI will partner to promote UK business opportunities in 12 Asian markets. The RBS Group is a global banking and financial-services firm that operates in the UK, continental Europe, the Americas and Asia, serving more than 40m customers. The Group provides a wide range of products and services to personal, commercial and large corporate and institutional customers through its two principal subsidiaries, The Royal Bank of Scotland and NatWest, as well as through a number of other well-known brands including, Citizens, Ulster Bank, Coutts, Direct Line and Churchill. The RBS Group offers transaction services in ten Asia Pacific countries, delivering cash, trade and supply-chain products and services to corporations and financial insti-tutions in multiple currencies across multiple time zones. The Group’s transaction banking business in the region employs over 500 staff and services more than 75,000 accounts. Its client service is rated one of the best in Asia. UKTI is the government organisation that helps UK-based firms succeed in the global economy. It also helps overseas firms bring their high-quality investments to the UK’s dynamic economy — acknowledged as Europe’s best place from which to succeed in global business. UKTI offers expertise and contacts through its extensive network of specialists in the UK, and in British embassies and other diplomatic offices around the world. We provide firms with the tools they require to be competitive on the world stage. Tax break for foreign firms? Reports said in October that the government could lower the corporate tax rate for foreign firms investing in Japan by between 10 and 15 percentage points over five years, starting in 2011. In June 2010, the government had identified encouraging foreign business as a preferred issue in its new growth strategy. For foreign firms that establish a regional base or R&D center, the tax rate could be reduced to 25-30%, about the same as in China, South Korea and other Asian countries. The incentive would be aimed at high-tech, medical, biotechnology and other technologically advanced industries. The government and opposition parties had already discussed lowering the corporate tax rate for all firms by 5%. In June 2009, Eisai Co., Ltd., one of Japan’s major pharmaceutical firms, invested more than £100mn in opening its European Knowledge Centre in Hatfield, Hertfordshire. This enabled it to integrate all functions on one site with more than 500 staff, combining manufacturing, discovery and clinical research, marketing, and European headquarters facilities. 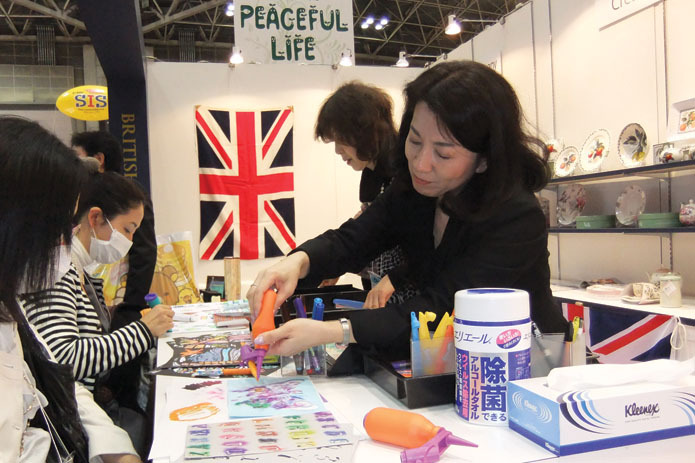 Recently demonstrating children’s colouring products at a gift show in Japan brought back wonderful memories of my childhood. This may sound like a strange activity in which to engage, but it is just one practical way we can support UK firms expanding into overseas markets.